I've spent the best part of a week thinking about how to process data from my solar inverter, and I think I'm on top of how to get it into a database. But that's only part of the story. What do I do with the data in the database? Do I want to create another page like the weather page? In principle the pretty displays that come with the inverter do most of that. So maybe it's time to step back and do something else. One thing that strikes me: what is using all the power? The daily reports (the ones that come in triplicate) confirm what Powercor	keeps telling me: we're currently using about 38 kWh a day. That's over 1.5 kW average. How? At first I thought that it was the computers and displays, but I've seen values as low as 500 W with the big TV display going, and I estimate that to use 200 W by itself. The fridges? The newest freezer claims to use 616 kWh per year, which corresponds to about 1.7 kWh per day. Multiply that by 4 (two freezers, one fridge, one combination) and we're still only at 6.8 kWh per day. What else? The air conditioner is an obvious culprit, but I see this consumption when it isn't running. I have some power meters that plug into the power points, but they're inconvenient: to read them I have to kneel on the floor and press buttons, far too much trouble. Isn't there anything that will connect with a network? Yes, of course. eBay is full of offers for “10XSonoff Power 10A Smart Home Automation Measuring Monitor Wifi Switch ControYO” from unscrupulous sellers like share-happy, who offer them for $3.20. And they don't seem to be available elsewhere. $3.20? Only joking, for that you get an only marginally related “Board DIY Kit”. The item itself costs $11.45, or $121.42 for 10. It's available much more cheaply from other sellers. High time that eBay put paid to this kind of deception. The problem is, that this nice device is only cloud-dependent. Meaning, you cannot run it without internet connection on your local network. Dammit, what happened to interoperability? Once upon a time we were on course to have a nicely integrated world network. Now marketeers and short-sighted product managers have built a Tower of Babel! Still, the article goes on to describe how to connect to it anyway. I suppose I should get hold of one and play around with it. On Sunday (Easter Day) we ate a boned leg of lamb, not as good as we have had it. Today we had the rest, and traditionally we make shepherd's pie out of it. OK, that's straightforward, right? I can do it after the bread I baked. It requires mincing the meat, of course, along with a significant quantity of bread (English-style soggy stuff). Today I forgot the bread and had to put it in later; fortunately it crumbles easily. How many herbs? I chickened out and used dried herbs, because I was in a hurry. How big a dish? I need to relate that to weight. Based on today's experience, I'd say between 1.2 and 1.5 g per cm² of dish. Do these numbers make sense? Barely. I get the impression that whoever created this table didn't know what he was doing. Maybe he was confused by the strange units. But it gets worse. Yvonne mixed "4 serves" according to the instructions and came up with something that was far too thick. She had to add another estimated 300 ml of water to make something useful. 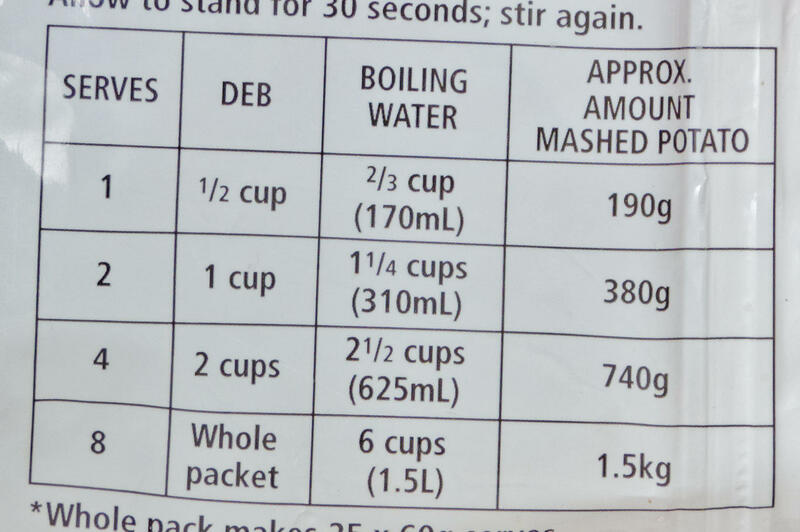 So at a guess that was 1 kg of mashed potato, and still not really enough. There were 700 g of meat, so the 1.6 times as much sounds right for the next try. Last time I wrote twice as much, but I don't think that is necessary. How much gravy? Last time I wrote: as much by weight as the meat. That's what I did this time, and it was too much. Maybe 80%? How simple a leg of lamb is by comparison: put in the oven, cook until 60°, and you're done! This page contains (roughly) yesterday's and today's entries. I have a horror of reverse chronological documents, so all my diary entries are chronological. This page normally contains the last two days, but if I fall behind it may contain more. You can find older entries in the archive. Note that I often update a diary entry a day or two after I write it. Do you have a comment about something I have written? This is a diary, not a “blog”, and there is deliberately no provision for directly adding comments. But I welcome feedback and try to reply to all messages I receive. See the diary overview for more details. If you do send me a message relating to something I have written, please indicate whether you'd prefer me not to mention your name. Otherwise I'll assume that it's OK to do so.